The city has unveiled a proposed bridge to carry the Metro Line LRT extension north, just ahead of a council vote on the project next month. 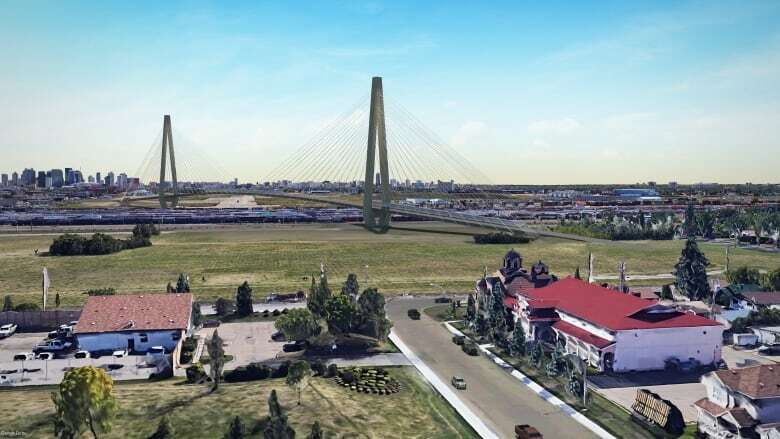 The cable-stayed bridge would stretch 650 metres across Yellowhead Trail and the adjacent rail yard before touching down on 113A Street. The city expects the bridge to cost roughly $200 million. The new Walterdale Bridge could fit between the pair of 75-metre tall towers supporting the bridge. The design plans for the Metro Line Northwest LRT extension were on display at the Spruce Avenue community league hall on Thursday night. "It'll be a great way to connect with the rest of the city," said Verna Stainthorpe, who's lived in the community for more than 50 years. "It's moving along quickly and it had stayed stagnant for so long," she said. "It's nice that they're taking control of it." City administration will bring final recommendations to council for approval during a public hearing on Nov. 6. Officials are hoping to begin the procurement process on the first phase of the project in early 2019, as they look for contributions from the federal and provincial governments. The first phase would connect NAIT with a station on the Blatchford development site, adding one kilometre of track to the existing line. 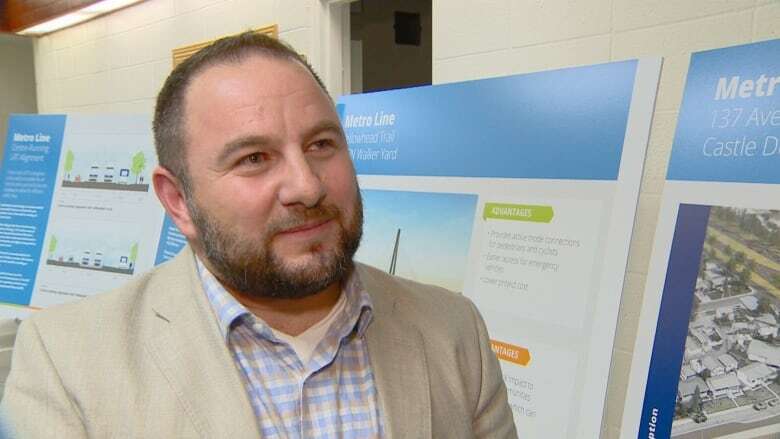 "A big cornerstone of the Blatchford development is encouraging more sustainable modes of transportation," said Nat Alampi, Edmonton's director of LRT infrastructure delivery. "So having an LRT route act as that transportation spine through Blatchford is critical to Blatchford achieving that vision." The first phase plan is unique, Alampi said, in that the city can lay down track through the neighbourhood before the expected 30,000 people begin to take up residence. Phase two would deal with the other 10 kilometres worth of track extensions, including the bridge. That phase of the project is still years away, as council prioritizes work on the Valley Line West LRT and the extension into Blatchford. The line is expected to run down the centre of Castle Downs Road before turning west along 153rd Avenue toward a final station at Campbell Road. City officials are recommending below-ground stations at the intersection of 137th Avenue and Castle Downs Road, and at 127th Street and 153rd Avenue. The line would be trenched, rather than fully underground, through those crossings. Those busy, arterial intersections remain open to traffic, without having to build expensive tunnels. The trenched stations would cost roughly $60 million more than if the track stayed at grade. A tunnelled option could potentially double those costs. Carrie Ellen Hawryluk said she would have preferred the LRT remain at street level as it crosses 137th Avenue to avoid the additional costs. 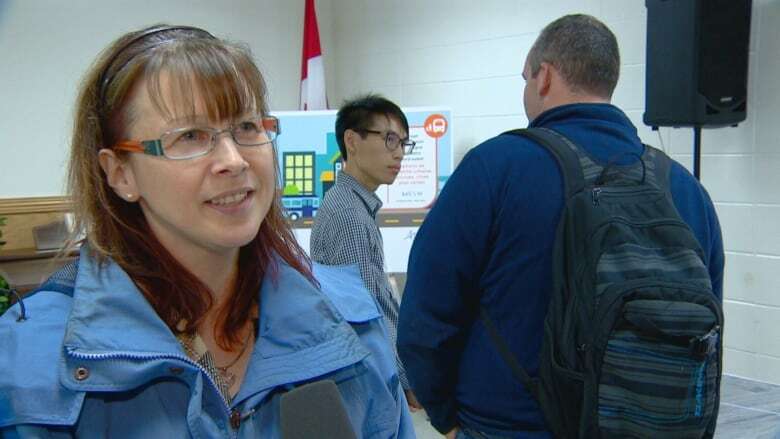 But after reviewing the plans, she was more fixated on an LRT connection that could bring her family from the Campbell Road area into the city. "I'm looking forward to it. I have two younger kids, so I'm hoping that this can get built by the time they're in university," she said with a laugh. The LRT would stay at street level as it crosses 153rd Avenue toward Campbell Road. A trenched option at the intersection could have cost as much as $250 million, adding 500 metres of tunnel and redirecting a major sanitary line, Alampi said. The street-level option would improve access to the abutting transit centre, Alampi said, without significant traffic disruptions. "The wait times at the LRT as they're crossing should be acceptable," he said.